Lynford is a large parish in the Breckland district of Norfolk. The parish once contained four villages – Lynford, West Tofts, Santon and possibly Caldecote. Lynford has now shrunk and all that remains is the large and imposing Lynford Hall (NHER 5150). West Tofts (NHER 5149), a medieval village, was moved during the creation of Lynford Hall Park (NHER 30470) in the 18th century. The earthworks of Santon deserted medieval village can still be seen (NHER 5688). The site of Caldecote (NHER 5691 or 42026), described in the Domesday Book, may be within the parish. All four villages are recorded in the Domesday Book. Lynford probably means ‘flax ford’ and comes from Old English. West Tofts means ‘west homestead’ and comes from Old Scandinavian. Santon means ‘farmstead with sandy soil’ (a very apt name for this Breckland village) and comes from Old English. Finally Caldecote means ‘cold or inhospitable cottages’ or ‘shelter for travellers’ and comes from Old English. There has been considerable archaeological investigation in the area. Available land was fieldwalked as part of the Stanford Training Area Survey (STANTA) and earthworks within the woodland were surveyed. 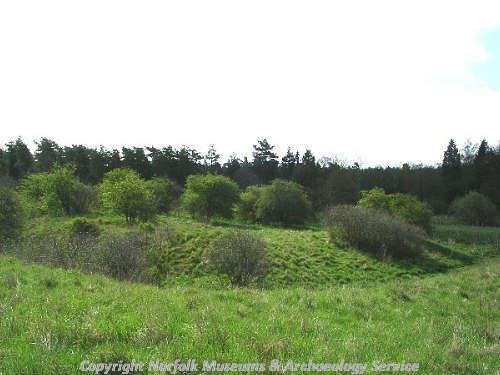 The area was also assessed as part of the Breckland Archaeological Survey. 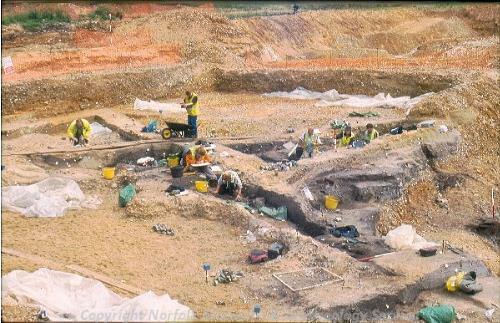 Extensive archaeological evaluations and assessments have taken place at Lynford Quarry (NHER 44671). The results of these investigations can be used to build up a picture of how the landscape has been used in the past. The earliest evidence of activity is a Middle Palaeolithic mammoth kill site (NHER 37095). Although this site is actually within Stanford parish it is commonly referred to as Lynford Palaeolithic site and therefore is included here. The quality and quantity of the artefactual, faunal and environmental evidence make this site the most important Middle Palaeolithic site in Britain to date. Palaeolithic handaxes and other flint tools (NHER 21499) have also been recovered from the quarry since it began extracting gravel in the 1980s. Other Palaeolithic handaxes (NHER 5119, 5121, 5124 and 5654), a Late Upper Palaeolithic long blade (NHER 37248) and worked flint flakes (NHER 5120, 5121, and 5654) have also been recorded. Mesolithic worked flints (NHER 11487, 11503 and 31731) including a harpoon barb (NHER 5130) and an axehead (NHER 13332) have been recovered. Excavation of a pond for wading birds by the Forest Authority recovered a large number of worked flints including flakes, an axe roughout and scrapers (NHER 31900). This has been interpreted as a Mesolithic or Early Neolithic occupation site. Flints were worked in the area during the Neolithic period (NHER 5131 and 35380). Thirty four possible Neolithic flint mines (NHER 5131) were excavated and refilled in the 1930s. Neolithic flint scrapers (NHER 5128 and 14034), an axehead (NHER 14800), arrowheads (NHER 14801, 14803, 14804, 14805, 21669 and 18150) and a knife (NHER 14802) have been found. One of the arrowheads is a very rare hollow-based example dated to the Neolithic to Bronze Age period (NHER 18150). This was found when a tree fell over in 1982. Only eighteen other examples of this type of arrowhead are recorded from East Anglia. This object may have been imported from the Low Countries or Ireland. Several Beaker period arrowheads (NHER 5122, 5123 and 5136) have also been discovered. A possible Bronze Age burial (NHER 5137) was discovered in 1720 or 1721. A wooden coffin containing human bones and 'thirty small beads, a black face made of Lancashire Coal, a golden funnell and a cipher' was found. Three possible Bronze Age barrows (NHER 5655, 13719 and 25767) have also been recorded. One of these is known locally as Blood Hill (NHER 5655). Pieces of Bronze Age pot (NHER 5664) and two Bronze Age knives (NHER 14039 and 34666) have also been recovered. 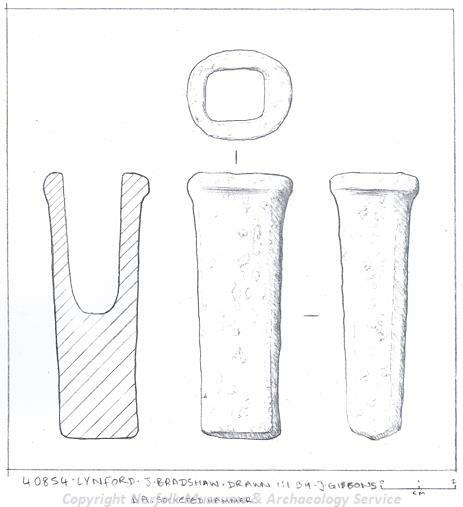 The Santon Iron Age and Roman hoard (NHER 5663) was found in 1897. It contains mid 1st century copper alloy and iron metalwork including smiths' tools, scrap metal, offcuts and unfinished new and renovated articles including ten brooches. Pieces of Iron Age pot (NHER 5665) have also been found. The possible prehistoric trackway The Icknield Way (NHER 1398) runs through the parish. This route was possibly used later as a Roman road. Just north of Santon Downham close to the Norfolk-Suffolk border is a large scatter of Roman finds (NHER 5659). These have been interpreted as the site of a Roman settlement. Excavations here in the 1920s recorded several 2nd to 4th century AD rubbish pits. A possible Roman cremation (NHER 5139) has been uncovered in Zigzag Covert. The ashes and burnt bones were contained in a pot. Pieces of pot have also been recovered from other sites (NHER 5140 and 44691) and during the STANTA Survey. Coins (NHER 5665, 5666, 17266, 18150 and 34523) and brooches (NHER 34524 and 40854) have also been found. A Viking burial (NHER 5668) was excavated in 1867. The body was accompanied by two ‘tortoise type’ brooches and a sword. The brooches and sword are all Scandinavian in style. 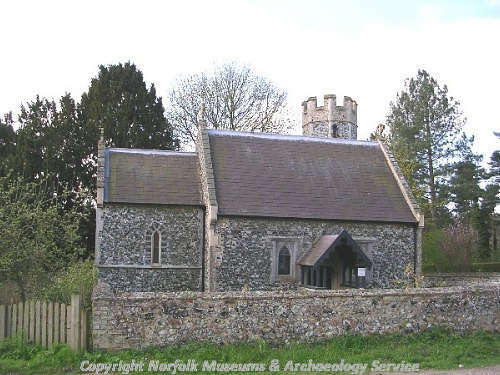 The inhumation is a very rare example of a Viking burial in Norfolk. There is very little other evidence for Saxon activity in the area although St Helen’s Church, Santon (NHER 5684) may possibly date back to the Late Saxon period. Pieces of Early Saxon (NHER 5140, 5667 and 44691) and Late Saxon pot (NHER 5669, 5670, 5671 and 7615) have also been recovered but there are no clear concentrations that indicate areas of settlement. Documents record that the medieval village of Lynford (NHER 5145) was uninhabited by 1467. No remains of the settlement can now be seen and the church has also disappeared. A church, or possibly a nonconformist chapel (NHER 15248), is shown close to Lynford Hall (NHER 5150) on Faden’s map of Norfolk made in 1797, but this may be a mistake. Earthworks still survive at West Tofts (NHER 5149). A series of subdued enclosure boundaries represent part of the former medieval village that was emparked in the 18th century. The moated site of Caston Hall (NHER 5148) and St Mary’s Church (NHER 5156) at West Tofts can still be seen. St Mary’s (NHER 5156) is an early 14th century church that was altered in the 15th century and largely rebuilt in the late 19th century by the Pugins. It is one of Britain's finest Gothic Revival churches. It is now in the Stanford Training Area and cannot be visited. More earthworks adjacent to Caston Hall (NHER 31035) may be a medieval rabbit warren. There are two churches recorded in the deserted medieval village of Santon (NHER 5688). The remains and associated earthworks at the site of St Helen’s (NHER 5684) date to at least the early 12th century. A 10th or 11th century grave marker has been found nearby. All Saints’ (NHER 5689) is also confusingly known as St Helen’s. It was rebuilt in 1628 on the site of a medieval church. One of the walls of the medieval church may have been reused. The chancel and tower were rebuilt and the nave was remodelled in 1858 using materials from St Mary's Church, West Tofts (NHER 5156). There was also a moated site close to the village (NHER 5688). All that remains of the settlement is Santonhouse Farm (NHER 12652) and Field Barn that probably stands on the site of Santon Warren Lodge (NHER 31770). Parts of the lodge have been reused in the barn. The location of the site of the deserted medieval village of Caldecote is unclear. Two possible locations are recorded (NHER 5691 and 42026). The Domesday Book entry for this village reveals that it contained a mill. In the medieval period warrening or the farming of rabbits was important to the local economy. Several warren boundary earthworks (NHER 42026, 31217 and 8155) are recorded. Other field systems (NHER 7615 and 7616) were also in place. Medieval finds include coins (NHER 17265, 17266 and 40854) and part of a 13th to 14th century stone column (NHER 19541). The area continued to be an important source for worked flints. In the post medieval period these were gunflints. Pieces of debris associated with the production of these have been found at several sites (NHER 5131, 5687 and 21307). The site of a brick kiln (NHER 15249) and an extraction pit (NHER 40715) are also recorded. Water meadows (NHER 5090, 31157 and 31242) were constructed by several of the large land owners as part of wider schemes for general land improvement. Several of these (NHER 5090 and 31242) were created in the 19th century by Nathan Lucas of Lynford Hall. The Old Hall, Lynford (NHER 5138) was built in 1500 and a second hall was built on the site between 1717 and 1720. This house was demolished in 1863 after Lynford Hall (NHER 5150) had been built to replace it. The brick, ashlar and slate building in Neo-Jacobean style was completed by architect William Burns in 1862. It was refurbished and reduced in size after a fire in 1928. It has been used as a filming location for the television programs 'Allo 'Allo, Dad's Army and You Rang, M'Lord? Lynford Hall Park (NHER 30470) contains formal gardens designed in the mid 1860s by William Burns and William Andrews Nesfield. There is also an early 20th century Japanese water garden. These are set within a landscape of park and woodland originating in the 18th century and greatly expanded in the mid 19th century. The Roman Catholic Church of our Lady and St Stephen (NHER 5153) was built in 1879 by Henry Clutton for Mrs Lyle Stephens of Lynford Hall (NHER 5150). It was during the construction of the Lynford Hall Park (NHER 30470) that the village of West Tofts was destroyed although some settlement seems to have survived. A 19th century charity school (NHER 5147) was built here by Sir Richard Sutton to provide a basic education for poor children, often including the sons and daughters of his servants at the hall. It was demolished in 1977. The Horseshoes Inn (NHER 44692) a 16th or 17th century timber framed building also survived until it was destroyed by fire in 1986. The moated site at West Tofts was later replaced by a country house (NHER 5149) that was later used as a rectory. A 19th century vinery wall, where grapes were grown, is all that remains of the house now. West Tofts Army Camp (NHER 25239) was later built over part of the site of the medieval settlement. The camp may have originally been built to house Belgian refugees. It was used by the government between 1935 and 1939 as a Labour Camp. It housed the unemployed from northern England. It became an army camp in 1939 and is still in use. There are still large World War Two air raid shelters on the camp. Megan Dennis (NLA), 12 June 2006.
http://news.bbc.co.uk/1/hi/england/norfolk/4439339.stm. Accessed: 12 June 2006.
http://www.norfolkchurches.co.uk/lynford/lynford.htm. Accessed: 12 June 2006.
http://www.norfolkchurches.co.uk/santon/santon.htm. Accessed: 12 June 2006.
http://www.norfolkchurches.co.uk/westtofts/westtofts.htm. Accessed: 12 June 2006.